← For this is all I know…. The set list is now official, as per the OS (slightly different order than below)! 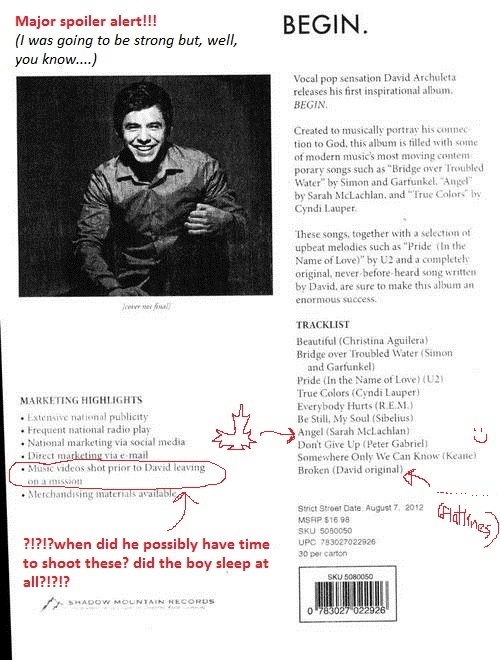 This entry was posted in Special event and tagged BEGIN., David Archuleta. Bookmark the permalink. Inspirational set list for sure. Like the Inspirational songs List. Also thought there was a song BEGIN. too!! I recall Kari saying two original songs. Love the Album cover. theColors are great!! David looks very pensive and mature. I’m still dying over the pic!!!! Best cover by far!!! Loving the track list…thinking this is going to be my favorite album to date :). CANNOT WAIT TO BEGIN LISTENING TO THIS!!! This guy never fails to amaze me…how many more days until 2014??? This old fan has to spazz some, for sure! !I I can only imagine David’s beautiful voice on these songs. Sarah’s Angel, True Colours…..have always wanted to hear David sing these! Not to mention the other songs and a new song, yes! Maybe another original will be added. How did he accomplish so much, videos too, in such a short time, yikes! He’s outdone himself. We are going to be some very, very grateful fans (already are but even more so). David never fails to amaze me either. Cannot wait to hear this wonderful and inspiring album! If anyone wants to check out the original songs on the tracklist, the awesome @CheMerf has put together a convenient playlist HERE! Can't really find my words this morning. But I am in love with this tracklist. IN LOVE. LOVE THE TRACKLIST. IS IT AUGUST 7 2014 YET? 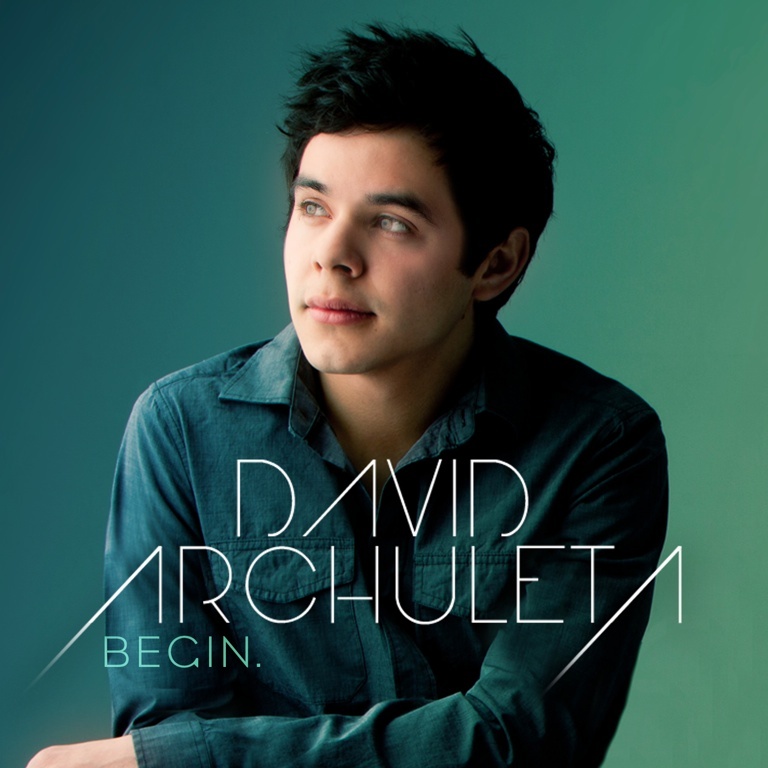 @archftw @DavidArchie yes he does. … maybe I’m imagining things, but he seems to sing a different way when he’s playing piano, it’s more personal somehow… in the vids from the MKOC Tour VIPs, I love the GP/LIBs when he’s playing (even though there are piano glitches)… haunting. I love David and piano, piano and David, one of my favorite things. Yes, there is something very personal about it. I agree, the Vids with GP/LIB were incredibly moving, even with a few glitches on piano! Just gorgeous and very special. BEGIN. is going to be outstanding. Gee, he’s been gone less than 3 months and look what he has given us and will be giving us. Really was not expecting so much goodness in such a short time. @HapppyDance yes it was! Cannot wait to hear what you all think about Broken that will be one the BEGIN. album. Yoo Hoo!! Love it and all the excitement!! To heck with beaches, bbq’s and baseball, who needs it….I neeeeed it to be Aug 7 NOW! I thought the time change ran the other way…? So that it would be at 8am EST Sunday, June 24th. lol I think it is Sunday am …. Hahaha, it is Sunday am 🙂 Remember when NA was on, we watched it Monday-Friday in the mornings (because it ran Monday-Friday in the evenings in the Philippines). So we are 12 hours earlier than there. I AM SO STOKED FOR THIS CD I CAN NOT STAND IT!!!!!!!!!!!!!!!!! I’m stealing your line ref (it’s exactly how I feel AND it’s hysterical), “I am eeeeeeeping all over my self” about this album. I realize now I can eeeeep and spaaaazzz simultaneously. Teen Wolf, lol, love it tofan! Hey everyone, can you believe what August 7th will be like on all the fansites? It’s going to be one big party!!! I’m with you refnef, “I AM SO STOKED FOR THIS CD I CAN NOT STAND IT!!!!!!!!!!!!!!!! !” There definitely MUST be a concert when he gets home singing these songs live. CAN YOU IMAGINE what it would be like? my pleasure, sweetonda! a big YES! to a BEGIN. homecoming concert!!! … and the “making of” BTS vid uploaded to youTube courtesy of @FSteven (from the Samsung site)!